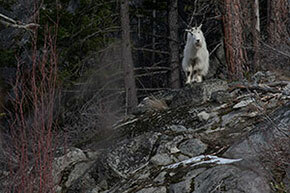 I been seeing mountain goats on the hillside below some cliffs (and on the cliffs) from the Snow Lake Trailhead parking lot near our house in Leavenworth, WA, so yesterday I hiked up the Snow Lake Trail about a mile or so until I came upon a group of 9 mountain goats, including young ones. 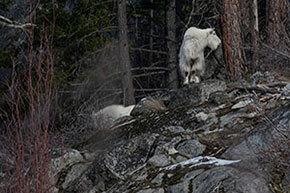 They’re out early this year grazing on new grass on the mountainside as the snow is already melting. Magnificent creatures.